Over the last few months, I have been working as an Outreachy intern with the GNU Guix crowd to develop videos presenting and documenting the project. My goal in this round as an Outreachy intern for the December 2018 to March 2019 period consists of creating introductory documentation videos about different topics for people who would like to use GNU Guix, admins and/or those who would like to join Guix community and don’t know where to start. Even interested or having a clear documentation, they might feel overwhelmed by it. I experienced this issue in the past with people in another context. My main tasks consist of creating a workflow for automating as much as possible the process of creating the videos, as well as, of course, creating the videos themselves. Creating the videos is not that easy as it might seem, I have to design them (I cannot automate that part), let the audio match the video, and matching the exact timing is quite difficult. Something very important that I should mention is that the workflow currently allows translations to other languages. It is a work in progress for too many reasons, specially because it keeps being improved all the time. Also, I had to study tools deeply both for the creation of the workflow and the videos because I did not know them beforehand or I knew just the basics. After trying several approaches for the workflow, the current one consists of creating “pieces of videos” and gluing them together in the end. Slide videos: they contain only a sequence of one or more slides. Command line session videos: they contain only Guix or shell commands and their output, without showing any slide at all. Workflow for creating each slide video. The inputs are SVG files and audio files. 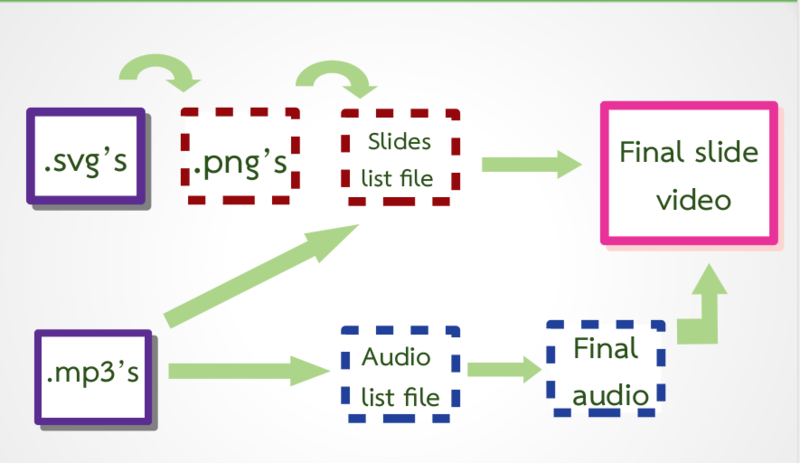 First, SVGs are converted to PNGs (“the slides”). Then, a text file having the order in which each slide will appear and the duration of the audio that matches it is created. An audio text file containing all the audio files sorted to have a complete audio file is created too. Lastly, with the slides' text file that has the reference to the slide files and the glued audio file the final slide video is made. 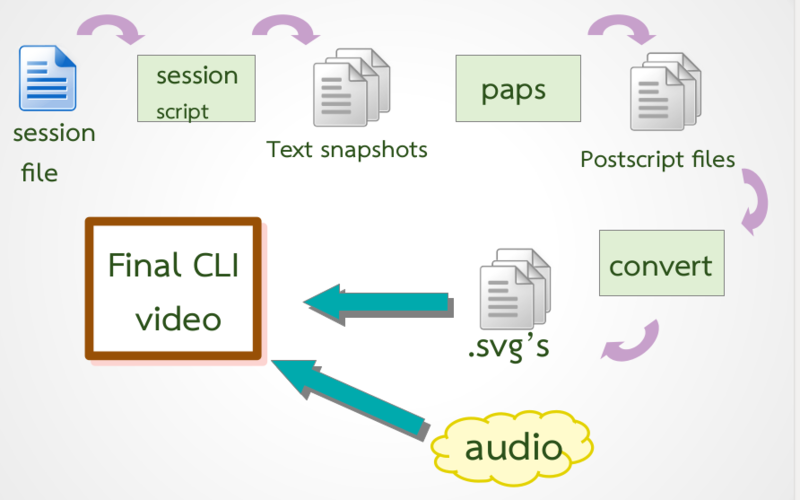 Workflow for creating each command line session video. The input is a session text file that has commands or meta-commands that are used to simulate, for example, the typing of a command, or the printing of it’s output. This file is passed to a Guile script that is in charge of executing the commands defined in the input text file and take text snapshots at a fixed time interval. Then, all these files are converted to postscript format. After that, they are transformed to SVG format. Finally, the process is repeated and the audio and the slides are glued to have final command line session video. Workflow for creating the final video. Slide videos and command line videos are a “bunch of videos” that need to be glued into the final one. They are sorted, and using the same tool for video creation our final introductory video is created. 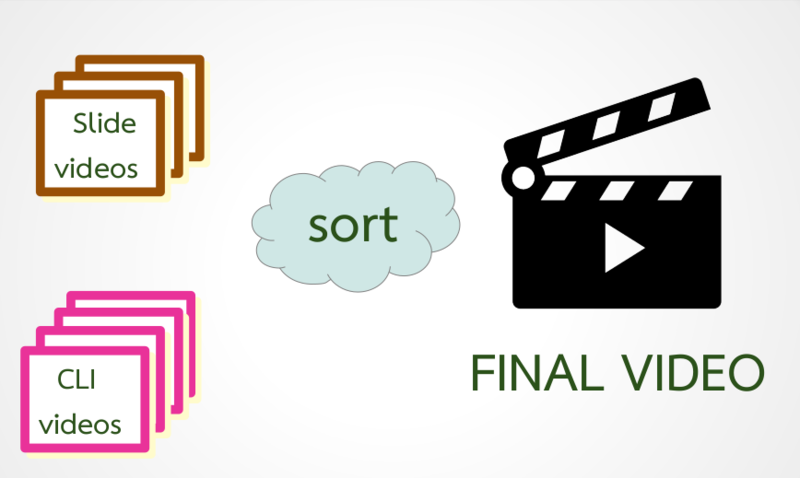 The code for this video creation workflow is available on Savannah. Enjoy! GNU Guix is a transactional package manager and an advanced distribution of the GNU system that respects user freedom. Guix can be used on top of any system running the kernel Linux, or it can be used as a standalone operating system distribution for i686, x86_64, ARMv7, and AArch64 machines. In addition to standard package management features, Guix supports transactional upgrades and roll-backs, unprivileged package management, per-user profiles, and garbage collection. When used as a standalone GNU/Linux distribution, Guix offers a declarative, stateless approach to operating system configuration management. Guix is highly customizable and hackable through Guile programming interfaces and extensions to the Scheme language.